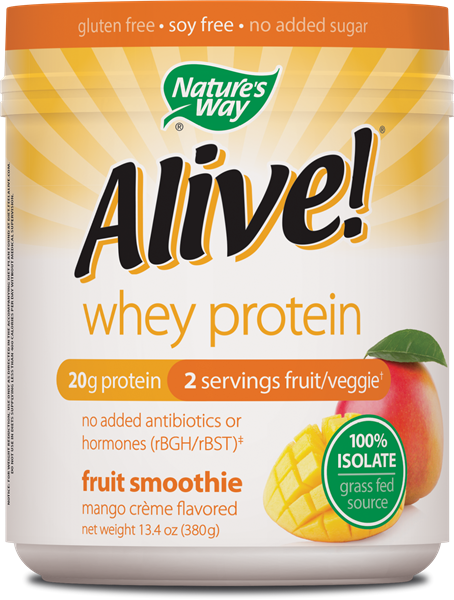 Alive!® Whey Protein (Mango) - Nature's Way®. Combine 2 scoops with 8 ounces of cold water or your favorite milk (dairy, rice, soy, almond, coconut or hemp). Mix well in shaker or blender for best results. †Each 38g serving (2 scoops) provides the equivalence of ½ cup fruit and ½ cup vegetable (volume before drying). erence between milk from cows treated with rBGH and untreated cows.